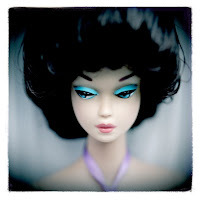 What in the world is a grown woman doing collecting Barbie dolls, let alone blogging about it? It mean, really?! What is the world coming to? LOL I've heard those sentiments so many times and guess what? I don't care. I love my Barbies! The name of this blog came from my brother. He would look at the Barbies in my bedroom and the dolls that came in when I ordered, shake his head and say "Vanessa, Don't just play Barbie, be Barbie!" Thus the title of this blog. If he had any idea that he would contribute to this I'm sure he would have kept that comment to himself. Click here to send me e-mail! Poll: How many dolls do you own? 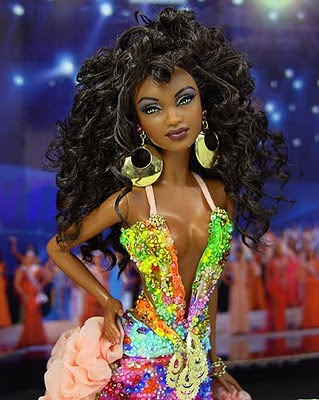 As soon as my campaign is over, I’m going to sell some of my Barbies and buy Ninimomos. I have had enough of admiring them online. I really, really want some. Take a look at this creation that won one of their mini-pageants. Miss Angola is absolutely gorgeous. If you haven’t checked out their doll pageants, it’s a must for doll collectors. The workmanship of their customized dolls is unbelievable – especially the detailed beading and fabulous hair re-roots and face re-paints. Check out the other delegates in this pageant and other pageants online. 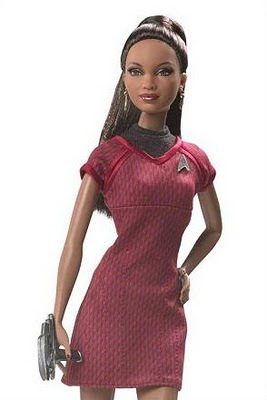 Oh yeah, before she was Miss Angola, she was Lt. Uhura Barbie. Do check out the Ninimomo doll pageants for more amazing transformations. Yo hace 26 años que soy fanatica de las barbie, eran mis muñecas preferidas y si fuera por mi las tendria a todos, son hermosas !!!! @universoplástico: I couldn't agree more. I'd love to add the Ninimomo dolls to my collection. They are pricey but worth the workmanship. @Teena: Thanks for visiting. I checked out your site and the outfit is lovely. Great restoration on that dol1. She's really beautiful, I really like realistic looking dolls, anyway speaking of realistic dolls I found this website http://www.ThatsMyFace.com/f/action_figure_head that can create a super-realistic doll heads of anyone from just a photo. Imagine making doll of yourself, your kids, your boss or your favorite celebrity! Apparently they can make the heads in many scales to fit Barbie-like dolls, Tonner dolls or even smaller figurines like Polly Pocket. NOTE: I do not represent all of these photos as my own; these are photos of Barbie and other dolls that I find to be fabulous! If you are the actual photographer and would like to be credited, send me an e-mail. 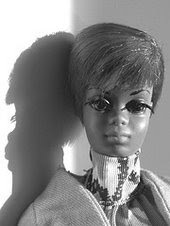 Barbie was named for a real young lady from California named Barbara Handler. Barbie, the teen fashion doll that debuted in 1959 was created by Barbara's mom, Ruth Handler, who named the doll after her daughter and the rest is doll history. 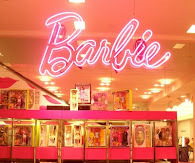 Click to visit Barbie Store.